Ninety-five percent of water used indoors from Eagle River water providers is returned to the river, while just 30 percent of water used outdoors makes it back to the river. That's why the recently released draft water efficiency plan focuses on reducing waste from outdoor use. The Eagle River Water & Sanitation District, along with the Upper Eagle Regional Water Authority, have released a draft water efficiency plan which sets ambitious goals for reducing waste despite projected increases in the region’s population. The Eagle River Regional Water Efficiency Plan aims to reduce the authority’s total metered water delivery by 430 acre-feet per year, or 8 percent, by 2030. It aims to reduce total metered water delivery by the Eagle River Water & Sanitation District, specifically, by 140 acre-feet per year, or 6 percent, by 2030. Much of those reductions are expected to come from residential outdoor water use. 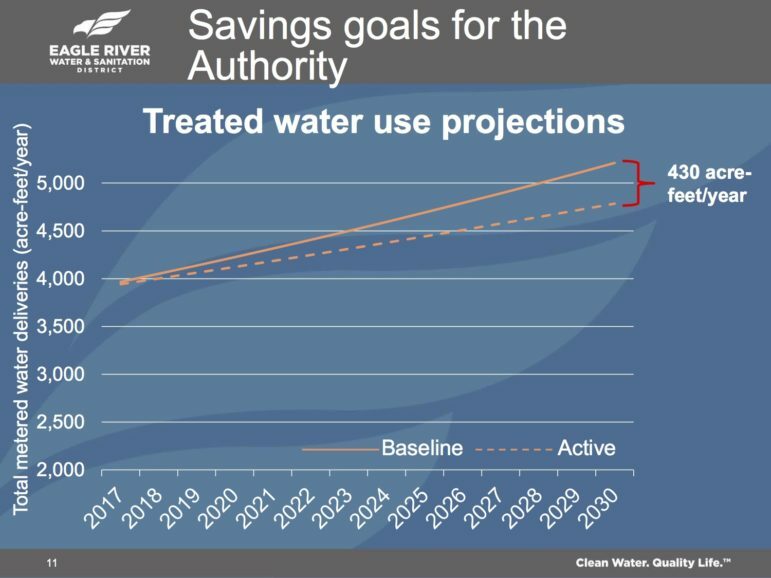 The Eagle River Regional Water Efficiency Plan aims to reduce the Upper Eagle Regional Water Authority’s total metered water delivery by 430 acre-feet a year, or 8 percent, by 2030. The solid line represents water use with no savings measures. During that same time frame, single-family equivalent annual growth rates in the district and authority are expected to rise 1.1 percent and 2.1 percent, respectively. The district and authority combine to provide water and wastewater treatment to towns and residential developments along the Interstate 70 corridor from Vail to Wolcott. “We are operating in our local basin, so we can really talk to our customers about how their water is used and like now, when we are in a dry period, how it’s directly related to the water they see in the river,” said Diane Johnson, communications and public affairs manager for the district. The plan breaks water users down into four categories: residential, commercial, mixed-use, and irrigation. It then sets goals for each category to become more efficient. Since residential use is the leading water use in both the district and authority — at 45 percent and 65 percent, respectively — residential customers are a key focus of the plan. The plan breaks residential customers down into two types. Type 1 are homes that have more indoor water use and small outdoor, irrigated areas. Type 2 homes have larger outdoor areas and typically use more water for irrigation. Type 2 customers typically use 2 1/2 times as much water as Type 1 customers, mostly because they have larger lots with bigger irrigated areas. 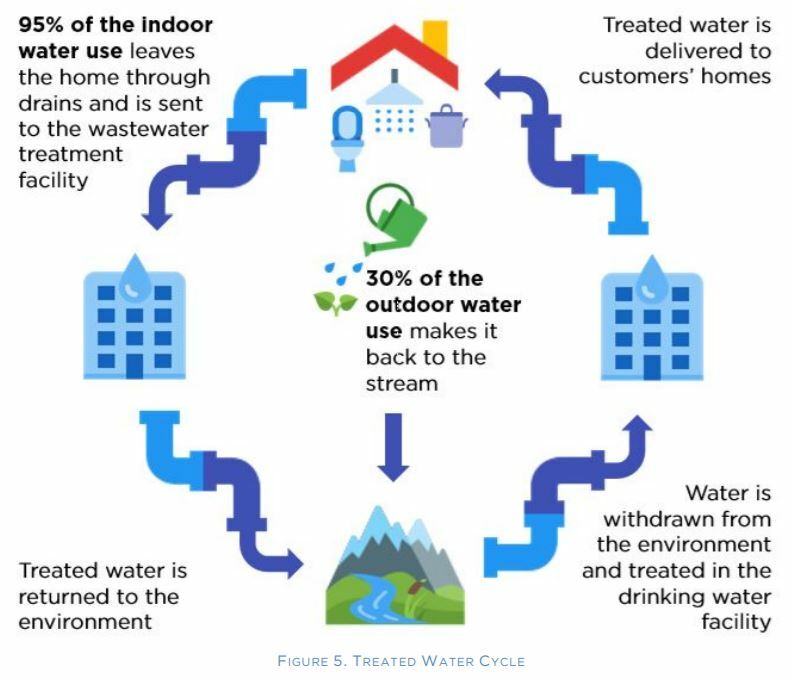 This distinction is significant because 95 percent of water used indoors is eventually returned to the river after it’s treated, but outdoor water use is mostly consumptive — just 30 percent makes its way back to the streams. Therefore, focusing efficiency efforts on Type 2 customers could result in more water savings. The plan sets a goal of a 10 percent reduction in outdoor water use by 2030 for Type 2 customers and a 7 percent reduction for Type 1 customers. But the plan doesn’t just saddle residential customers with more restrictions and regulations. The plan’s philosophy is not about asking customers to use less; it’s about empowering them to waste less. And to that end, the plan outlines soon-to-be-implemented demand-management programs, several of which build upon programs the district already offers. They include incentives and rebates for water-efficient landscaping and technology upgrades to irrigation systems, converting high-water-use landscapes into plantings that use less water and giveaways of indoor products such as low-flow showerheads and faucet aerators. 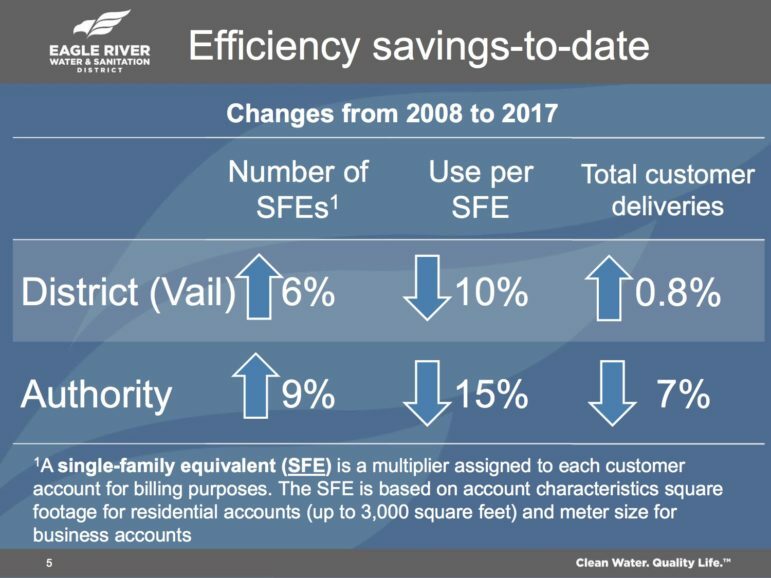 This graph shows that with previously implemented water savings measures, the Eagle River Water & Sanitation District and Upper Eagle Regional Water Authority have been able to reduce the amount of water used per single family equivalent even as the region’s population has grown. The Eagle River Regional Water Efficiency Plan aims to expand those demand management programs. This summer, the district has also hired a water conservation intern, who will help with irrigation system consultations. Water managers found that seemingly similar properties were using vastly different amounts of water. The question was, why? The answer could be as simple as turning sprinkler heads to avoid spraying on driveways. The plan also outlines how customers can use a software platform to understand their water use, set efficiency goals and see how their water use compares to their neighbors’. For the past five years, staff has been converting the water meters of the district’s 10,000 customers to advanced metering infrastructure. About one third are now ready to take advantage of the new software, Johnson said. In addition to residential customers, the plan sets the goal for commercial and mixed-use customers to reduce water use by 5 percent within the boundaries of the authority and 3 percent in the district by 2030. Irrigation-only customers have a goal of reducing water use by 10 percent by 2030. Editor’s note: Aspen Journalism is collaborating with the Vail Daily on coverage of rivers and water. This story ran in the Vail Daily print edition on July 10, 2018.